View More In Dishwashing Equipment - Page 4. 5-Year Manufacturer's Guarantee! 180 Day Return&Money Back Guarantee. Can be extended to fit most sinks. 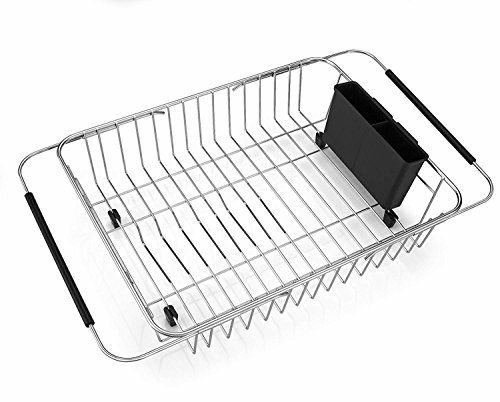 Please check the size of dish rack and kitchen sink before you choose this product.SIZE- The dish rack is15"Lx12"Wx 4"H(Collapsed) and 21 inches Long (two handles fully Extended) to better fit your sink.With adjustable bars fits over the sink, on countertop or in the sink and takes up only a fraction of the space. MUTIPLE FUNCTIONS - With slots, this in sink dish drainer can hold up 7 dishes.hold plates and cups, wash pots/pans/knives by hand, dry or rinsing vegetables and fruit. Separate compartments keep utensils neat and organized. UTENSIL HOLDER -Non slip extendable rubber arms keep the rack not fall down into the sink and four rubber-coated feet to protect your sink and counter from scratching perfectly. RUSTPROOF - Food grade 304 stainless steel eliminates rust, corrosion, acids and alkali damages to ensure long lasting durability. 5 Years Manufacturer's MANUFACTURE'S WARRANTY - We stand by the 24-hour Salt Tests, never rust stcinless steel. If you are not satisfied with the product, please contact us, we will refund you unconditionally. If you have any questions about this product by SANNO, contact us by completing and submitting the form below. If you are looking for a specif part number, please include it with your message.